Social interaction improves quality of life for dementia sufferers. 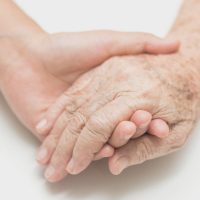 The research - which was led by the University of Exeter, King's College London and Oxford Health NHS Foundation Trust - trained key care home staff to deliver person-centred care, such as talking to residents about their interests. The trial involved more than 800 people with dementia across 69 care homes in south London, north London and Buckinghamshire. Two "care staff champions" at each home were trained over four day-long sessions, to take simple measures such as talking to residents about their interests and decisions around their own care. When combined with just one hour a week of social interaction, the programme improved quality of life and reduced agitation and aggression in people with dementia, the study found. Professor Clive Ballard, of the University of Exeter Medical School, said: "While many care homes are excellent, standards still vary hugely. "We have previously found that the average amount of social interaction for people with dementia was just two minutes a day. It's hardly surprising when that has a knock-on effect on quality of life and agitation. "Our approach improves care and saves money. We must roll out approaches that work to do justice to some of the most vulnerable people in society. "Incredibly, of 170 carer training manuals available on the market, only four are based on evidence that they really work. That is simply not good enough - it has to change." Importantly, the approach also saved money compared to standard care. Researchers say the next key challenge is to roll out the programme to the 28,000 care homes in the UK to benefit the lives of 300,000 people with dementia. Dr Jane Fossey, from the Oxford Health NHS Foundation Trust, said: "Taking a person-centred approach is about getting to know each resident as an individual - their interests and preferences - and reflecting these in all aspects of care. "We've shown that this approach significantly reduces agitation and saves money. Rolling out the training nationwide could benefit many other people." You can still enjoy the holiday you and your loved ones need with our specialised seniors travel insurance packages.